Certain eats open the floodgates to unhealthy habits. Learn how to outsmart the sneaky culprits that derail your diet. In the same way the some drugs pave the way for even harder ones, a weakness for a certain food can open the door to an avalanche of bad eating choices. “Some foods are like gateway drugs”. “From your brain’s viewpoint, there is no difference.” These so-called gateway foods make you feel out of control, maybe even physically unable to stop reaching for more, in part because of their addictive effect on your mind and body, according to research. But rehab is probably easier than you think. Most of us eat for a lot more than just survival. Merely looking at or thinking about a food you know you love activates the reward portion of your brain, the nucleus accumbens — the same area stimulated by drugs and alcohol. this triggers the release of dopamine, a feel-good chemical that enhances your awareness of that food (so forgot ignoring it!). And once you’ve taken that first bite, watch out. Tasting food engages all of your senses (and may be felt more intensely in women than in men, for unknown reasons). Your nervous system responds by secreting insulin (which drops blood glucose) and relaxing your stomach muscles, which makes you feel like you need to eat more to be satisfied. There’s a reason this happens almost exclusively with fatty and sugary foods and not, say, lettuce. The saturated fats in foods like bacon and cheese impair your brain’s normal ability to regulate appetite and cravings, so you don’t realize you’re full until you’re completely stuffed. That effect on your appetite can last for up to three days, the length of time it takes to flush those fats from your system. So one unhealthy indulgence can end up triggering a major relapse. Add sugar to the fatty food-ice cream, cake, doughnuts-and you have a double whammy. High-sugar food increase your levels of ghrelin, a hormone that stimulates appetite and increases cravings. “So you may tell yourself wanting more and more, the more you eat”. Sugar also has been shown to enhance memory storage, which may explain why you want it in the first place, and so much of it on special social occasions.Your brain has evolved a system of rewards that gives you a real high when you eat sugar. 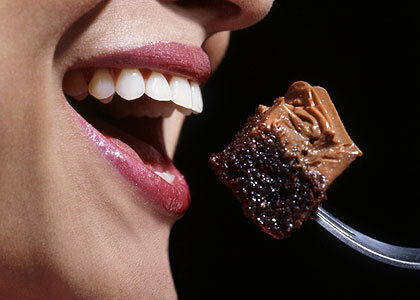 “The brain responds to both sugar and fat by releasing endorphins”. Chemically, those feel-good compounds are similar to morphine and can have a biological impact similar to a shot of heroin — including causing you tp jones for another fix when the initial euphoria begins to fade. One of the best times to stop a binge is before it begins. A 2010 study by researchers found that thinking about a craving uses up mental energy-enough that you’ll struggle to do anything else. But if your brain is otherwise engaged, you’ll have fewer cognitive resources available to conjure up mental images of brownies. So when a craving hits, try doing long division, Sudoku, or counting backward, and see if it goes away. If you’re three bites into a pint of Cherry Garcia when you feel a pang of regret, switch to a healthier snack. Once your senses have been engaged, your body is going to demand more food, but you can still decide what to give it. Sorbet or a piece of fruit can freshen up your palate, which can help put the brakes on cravings. Proximity to food influences how much of it you eat. Keep healthy foods right where you can see them, and just don’t keep unhealthy ones anywhere near at all. Maybe you couldn’t stop yourself from polishing off the chocolate sundae, but that’s no reason to give up. We tend to focus on the short-term consequences of our actions. But keeping a long-term goal in mind-say, fitting into that really cute bikini-can help you realize that you can still get there despite a setback. Think of it this way: Every meal is a chance to start over and do it right. These reverse-gateway foods taste like cheating, but they’ll help you get back on the weight-loss wagon.